Yule is a naturally sacred time, especially if you reach back to its simple yet profound seasonal origins. The three traditional rites come from the reality of long and dark Northern winters -- lack of greenery, lack of light and lack of warmth. Yuletide or Wintertide are ancient names for the season of the Sun's rebirth at Winter Solstice. This happens annually on December 21, but sometimes a day before or after. The sight of verdant green was a tonic for the winter-weary, and it's also a merry reminder that though most of nature is in its dead-phase, Spring will come again. 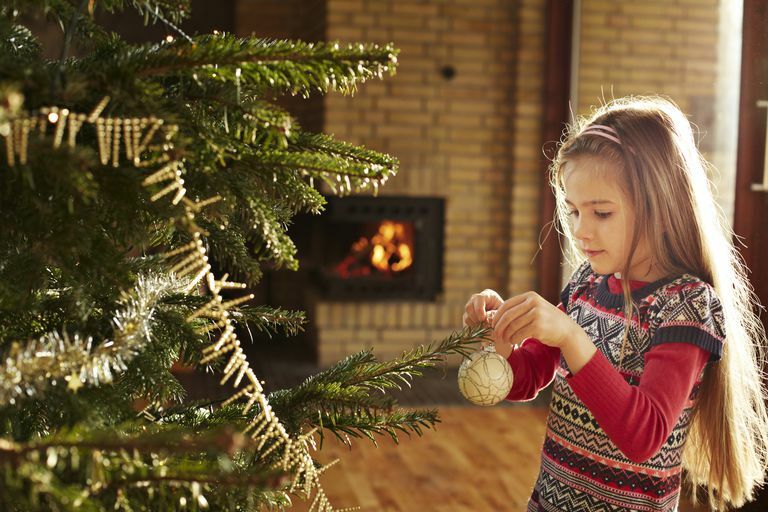 A budget-minded way to deck the halls is to take fragrant tree trimmings from the big box hardware store -- the stores usually have a box of branches, where you'll see other frugal decorators. The evergreens of the Christmas season are very familiar -- Fraser fir, holly, and the aphrodisiac mistletoe. Other greens of the season are rosemary, bay, ivy, and yews. According to Ronald Hutton's "Stations of the Sun", Yule brought with it traditional rites of purification and blessing. One that stood out is the Scottish Highlands tradition of the burning of the shrub juniper, as part of a "saining" ritual to protect the home and barn animals from "trows" (trolls). This is reminiscent of today's ritual of smudging with sage, since, writes Hutton, it involved "all openings being stuffed to hold in the acrid smoke, as a literal and spiritual fumigation." So bring some green into your realm this season, as a reminder that like nature, you're able to regenerate, and be reborn with the new Sun. Torchlight processions are incredible sights, and recently seen in Europe with the re-invigoration of ethnic identity. In more recent times, on the Shetland Islands, the Yule tradition was for men to carry torches, and pull a Viking longboat to the water, and then set it on fire. Winter is known as the Season of Lights, and so many holiday rites involve lighting candles. St. Lucia's Day in Sweden and other Scandinavian countries have the lovely tradition of wearing a candle wreath or girls dressed in white carrying candles. The long nights really bring out that instinct to light candles or sit by the fire -- why not quiet down, unplug and spend some time staring into the eternal flame? All you need is a candle, and the will to disconnect from the artificial flickering lights of our time. This could signify the beginning of a new year drawing more from your internal light, than from outer input. It could also be a symbolic reminder of the deep natural background rhythm and solar year that's always there, under the artifice. The Yule Log harkens back to the days of the old-fashioned open hearth. They would pick one big enough for the whole day of feasting and reunion. The need for warmth makes us think of those in need, and traditionally it was a time for neighborly charity. Wassailing comes from an Anglo-Saxon that translates to "be thou hale," as in hale and hearty. To "go wassailing" was go around to the wealthy, like the landlord in feudal England, and offer wassail from the bowl, in exchange for gifts. They would sing songs, or carols, which are still very much a part of holiday tradition today. The generosity would extend to the orchard, where cider would be spritzed on the trees and wishes conveyed for protection and a good harvest. There are many ways to be generous to other people, to animals or other growing things, and not all of them require a credit card. What is yours? Winter Nights: When Does Yule Begin? Does Yule begin when the Sun is more fully in its waning, after the Solstice? The Venerable Bede was a chronicler of Anglo-Saxon customs and wrote in 730 AD of a great feast on December 24th called Modranicht, or Mother Night. But was that the already-Christianized date? Seana Fenner of Odinia.org writes of Yule that, "Our Nordic ancestors reckoned ritual dates in terms of nights rather than days, and celebrated in advance of the day in question, and Yuletide, in particular, is thought of as a series of sacred nights, as we can see, for example, in the case of the still surviving Heathen German greeting, 'Fröhliche Weihnachten'. Weihnachten means 'sacred nights.'" The case is made that our Nordic ancestors would not have celebrated the day when the Sun "stood still" at the solstice. They would've waited until it was on the move, turning, Fenner writes, toward "light, warmth, and fertility." It's noted that King Hakon I of Norway moved the Yule dates up 3 days to coincide with Christmas. Fenner writes, "The Winter Solstice is the beginning of what was, for our ancestors, an adventure of the spirit and a trial of nature, followed by rejoicing." This makes a lot of sense as there's a deep hush at Solstice, that is a more inward, contemplative setting. The upside then is enjoying an extended season that mirrors the Sun's stillness, and then its motion. In mid-1800s England, there was a renewal of celebrations to do with Christmas, as a time of protecting children, and childhood innocence. It was then that Charles Dickens rose to fame, with his beloved moral tale " A Christmas Carol". That is a noble pursuit in our time, and it begins with bringing our annual rites back in line with nature and the purifying Sun. If you keep it simple with greening, lights, and warmth, there could be new traditions that roll out from those essential seasonal markers. However you celebrate this turning point of the Sun, may it be a merry and meaningful one!